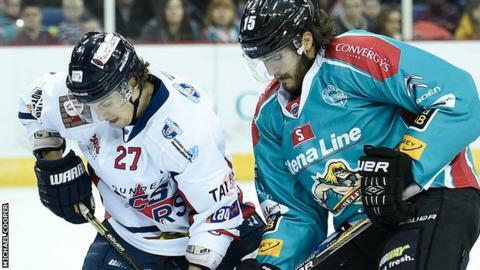 The Belfast Giants are just three points behind Elite League leaders Sheffield after Tuesday's emphatic victory over the Dundee Stars. Colin Shields led the scoring in a one-sided encounter with a hat-trick. Kevin Westgarth and Mike Kompon scored two each and the other Belfast goals were netted by Mark McCutcheon and Darryl Lloyd. After Tuesday's games, Sheffield lead Braehead and Cardiff by one point and the fourth-placed Giants by three. Belfast now have a double-header against the Sheffield Steelers at the Odyssey Arena this weekend. They took the lead on an early powerplay when Kompon's attempted pass went in off a Dundee skate. Paul Swindlehurst got the visitors level but the Giants went on to dominate proceedings. Darryl Lloyd restored the home side's advantage and Shields scored his 200th Elite League goal to make it 3-1 by the end of the first period. McCutcheon shot past Stars beleaguered goalie Marc Cheverie while Westgarth, Shields and Kompon added further scores in the second period. Sean Ringrose scored for Dundee but Shields completed his hat-trick for 8-2. Kevin Quick got Dundee's third before another Westgarth blast rounded off the scoring.